The third issue, in terms of the story, is perhaps the one with the most emotional punch. In the previous issue, we saw that the vampires were ready to launch their full-force attack on the Shogun and the warriors gathered for the wedding between Kichiro’s brother Orochi and Mitsuko. Now we see how all that plays out, in all its full action glory. There are a lot of reversals herein, since it is almost a given that when vampires attack, someone is going to get bitten. And the final page makes clear the direction that the story is going, and hinting at how it will all flow on from here. While I enjoyed the issue quite a bit, the story left a lot to be desired. The pace is frenetic and we move from one moment to the next. The story never really gets any time to breathe, to let things play out on their own. This ruins some of the character development since we spend so little time with the characters who are bitten, and we don’t really see much of Kichiro either. He gets relegated mostly to a few action scenes while the rest of the story moves on. But there were still some really good moments here, such as the vampires’ charge at the samurai and Orochi’s transformation, all of which were handled really well. And since the characterwork has already been established, we see how Levin delves into the setting itself, showing us more of the vampires than we have seen thus far and we finally learn what the monsters, the akuma, are planning on doing in Japan. We still don’t know just why they have arrived here of all places, that is, why they left Europe, but Levin has set the story in the right direction with this issue as far as I am concerned. Jessada Sutthi’s art continues to impress as before. This issue was good clean fun. All the vibrancy that was present in the first two issues is in full force here as well. Some of the action scenes are a bit indistinct as to who is fighting whom, but its entertaining to see how Sutthi plays the samurai against the vampires. Lots of powerful action here. 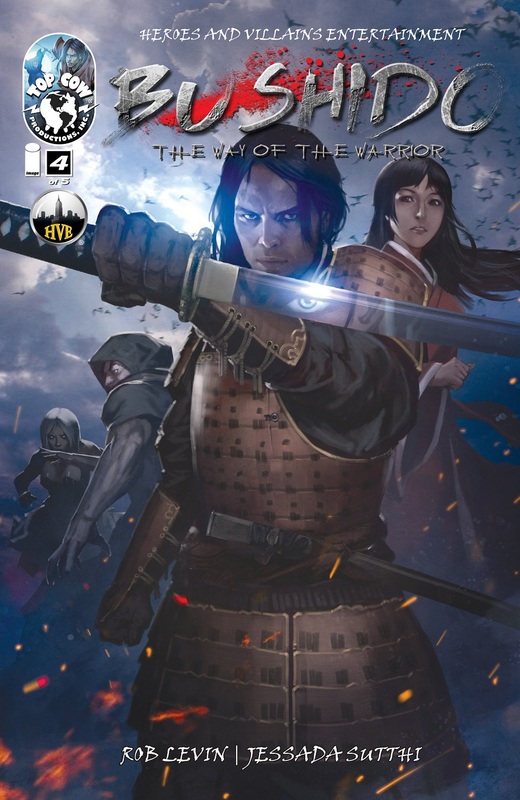 The fourth issue was all about setting up the final confrontation, even as Kichiro and Orochi themselves face-off for what they believe in, what they desire. With this issue, Levin does a fairly decent job of moving the story along and giving us a glimpse of just how all the cards that he has been laying out are going to fall. While this issue was largely predictable, it was fun to see the execution regardless. That is what is most essential in such cases since even a predictable story can be fun to read if it is well-executed by the writer, which was the case here. That said, some of the interconnecting bits of story were frustrating since they came across as plot-driven conclusions rather than something happening naturally through the characters themselves. This is the one of the reasons why I’ve said before, and I repeat, that this story isn’t working so well as a 5-issue mini-series. At least one more issue in the mix would have worked far better. The story is just too compressed and this issue makes that plain as day. The interactions between the leader of the vampires and Orochi falls a bit flat because the story doesn’t take a moment to let Orochi reflect on his decisions, to consider the consequences. Similarly, the confrontation between Orochi and Kichiro falls flat because it is over before it even begins. It was as if there are panels missing in the story. But, as with the preceding issue from last week, there was plenty to like as well. I said above that this issue sets up a final confrontation, between Kichiro and the leader of the vampires. Given that this series is titled Bushido and it is a story about samurai and feudal Japan, it shouldn’t be a surprise that we finally get to see Kichiro achieve what he has most wanted, as a preparation for that big confrontation. His character arc is now moving into its final stages and we see the uncertain young man becoming a warrior, a true samurai who respects and obeys the teachings of Bushido. Jessada Sutthi delivers another great-looking issue. He gets the fierce savagery of the vampires down really well here, and the entire mood he creates aptly reflects Levin’s script. More than the story itself the series has been enjoyable thus far because of Sutthi’s artwork. And it is in this issue, more than the other three previously, where Kichiro definitely stands out from Orochi, where his foreign heritage is most at display. Before, it was a tough job to distinguish the Kichiro as someone who is not from Japan. Not so this time. And its slightly weird that on the cover, Kichiro looks a bit like Taylor Kitsch (X-Men Origins: Wolverine, Battleship, John Carter). Sutthi should have used that look from the get go! All that remains now is the final big moment, which will be next Wednesday, issue #5. Hopefully it will be a short wait! 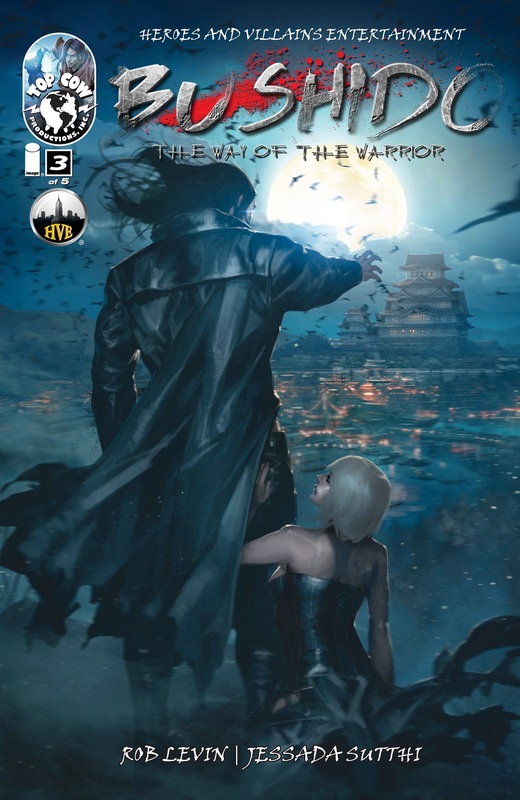 Posted on October 23, 2013, in Comics Reviews, Review Central and tagged Bushido, Comics, Comics Reviews, Feudal Japan, Heroes and Villains Entertainment, Image Comics, Jessada Sutthi, Review, Review Central, Rob Levin, Samurai, Studio HIVE, Top Cow, Top Cow Comics, Troy Peteri, Vampires. Bookmark the permalink. 2 Comments.